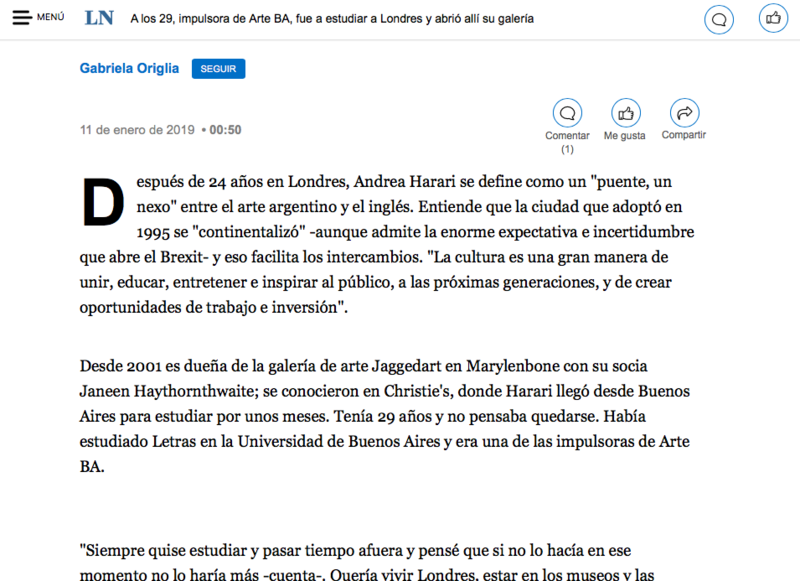 Después de 24 años en Londres, Andrea Harari se define como un "puente, un nexo" entre el arte argentino y el inglés. Entiende que la ciudad que adoptó en 1995 se "continentalizó" -aunque admite la enorme expectativa e incertidumbre que abre el Brexit- y eso facilita los intercambios. "La cultura es una gran manera de unir, educar, entretener e inspirar al público, a las próximas generaciones, y de crear oportunidades de trabajo e inversión". Desde 2001 es dueña de la galería de arte Jaggedart en Marylenbone con su socia Janeen Haythornthwaite; se conocieron en Christie's, donde Harari llegó desde Buenos Aires para estudiar por unos meses. Tenía 29 años y no pensaba quedarse. Había estudiado Letras en la Universidad de Buenos Aires y era una de las impulsoras de Arte BA. "Siempre quise estudiar y pasar tiempo afuera y pensé que si no lo hacía en ese momento no lo haría más -cuenta-. Quería vivir Londres, estar en los museos y las galerías". 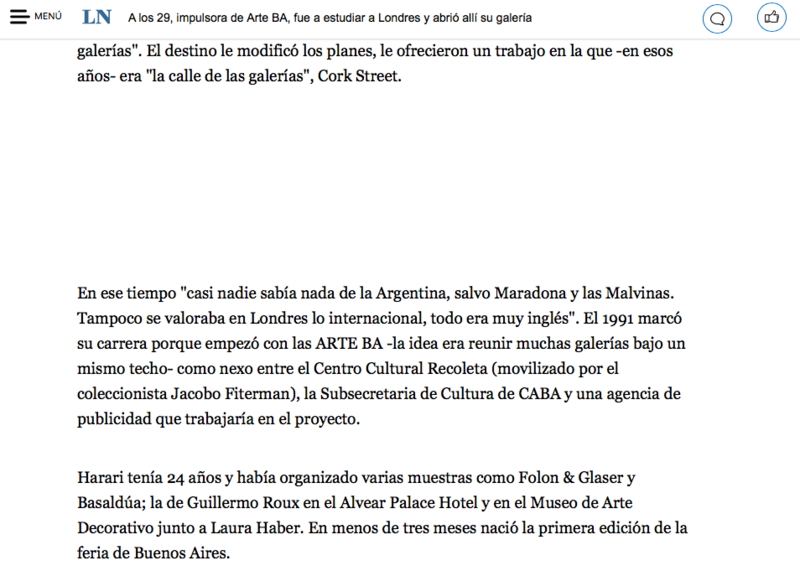 El destino le modificó los planes, le ofrecieron un trabajo en la que -en esos años- era "la calle de las galerías", Cork Street. En ese tiempo "casi nadie sabía nada de la Argentina, salvo Maradona y las Malvinas. Tampoco se valoraba en Londres lo internacional, todo era muy inglés". El 1991 marcó su carrera porque empezó con las ARTE BA -la idea era reunir muchas galerías bajo un mismo techo- como nexo entre el Centro Cultural Recoleta (movilizado por el coleccionista Jacobo Fiterman), la Subsecretaria de Cultura de CABA y una agencia de publicidad que trabajaría en el proyecto. Harari tenía 24 años y había organizado varias muestras como Folon & Glaser y Basaldúa; la de Guillermo Roux en el Alvear Palace Hotel y en el Museo de Arte Decorativo junto a Laura Haber. En menos de tres meses nació la primera edición de la feria de Buenos Aires. 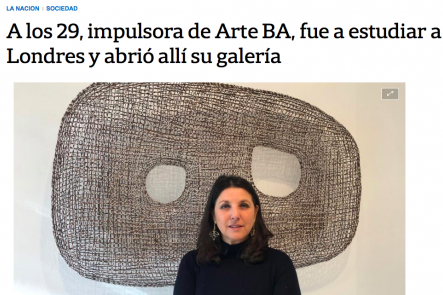 Admite que no tenían la visión de que Arte BA se convertiría en lo que es hoy; incluso recuerda una reunión en la que muchos galeristas estaban bastante reacios, "pero había espíritu de colaboración y ganas". Como suele suceder, la realidad superó las expectativas y la feria logró trascendencia internacional. La Fundación Arte BA era "pequeña como una familia, pero con un motor enorme, con Fiterman a la cabeza; fue creciendo hasta convertirse en una plataforma única para el arte en Sudamérica". Tiene una iniciativa en el tintero; piensa en regresar a una ARTE BA con coleccionistas ingleses "a mostrarles mi país y el arte de allí". En 2010 la convocaron a colaborar con "Pinta Londres", una idea impulsada por Diego Costa Peuser, Alejandro Zaia y Mauro Herlitzka. "Entonces el arte latinoamericano no era muy conocido acá; algunas galerías mostraban a algunos artistas, pero eran pocas". 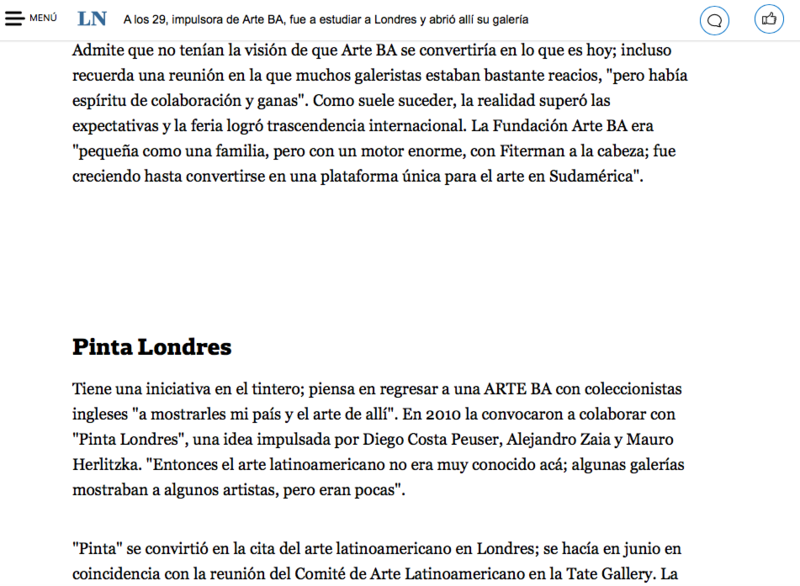 "Pinta" se convirtió en la cita del arte latinoamericano en Londres; se hacía en junio en coincidencia con la reunión del Comité de Arte Latinoamericano en la Tate Gallery. La feria fue una "gran precursora y promotora" en un segmento de entendidos y muchas instituciones inglesas y europeas compraron para sus colecciones. La última edición se hizo en 2014. "La demanda de arte es enorme, internacional, con gustos tan variados y distintos que hay lugar para todos. Hay un respeto y seriedad en cómo se hacen las cosas. La palabra vale y si alguien dice algo, se cumple", repasa y menciona una anécdota a poco de llegar: "En mi primer trabajo le dije a mi jefe que un cliente pagaba con un cheque, si podía aceptarlo. 'Me miro como si viniera de Marte'". Enfatiza que la ventaja de los argentinos es que son "resourceful" o sea, ven oportunidades y piensan fuera de la caja. "Sabemos trabajar con pocos recursos y tenemos una flexibilidad y espontaneidad que ayuda. Pero ser profesional, cumplir con las cosas, programar con tiempo, eso es fundamental". En su galería tienen una estética y una programación muy definidas; se iniciaron con obras en papel cortadas de libros, de mapas, pastos, tejidos, con textura y tridimensionales. "El público entonces no estaba muy acostumbrado a comprar ese tipo de obras, ahora la estética cambió. 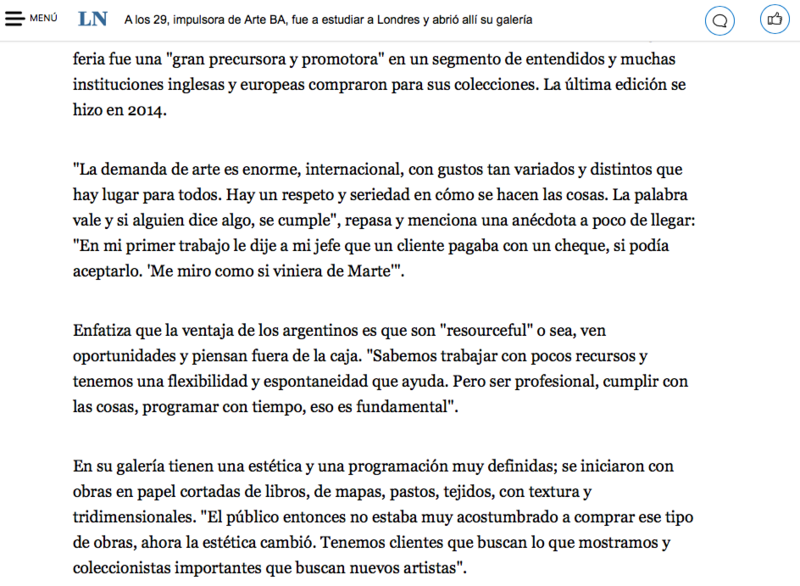 Tenemos clientes que buscan lo que mostramos y coleccionistas importantes que buscan nuevos artistas". Trabajan con consultores, decoradores y arquitectos para instalaciones específicas. "Obras hechas con tiempo y gran conocimiento de los materiales y de la técnica. Son orgánicas y poéticas. Hay un auge de lo que es único y tiene la huella del artista". 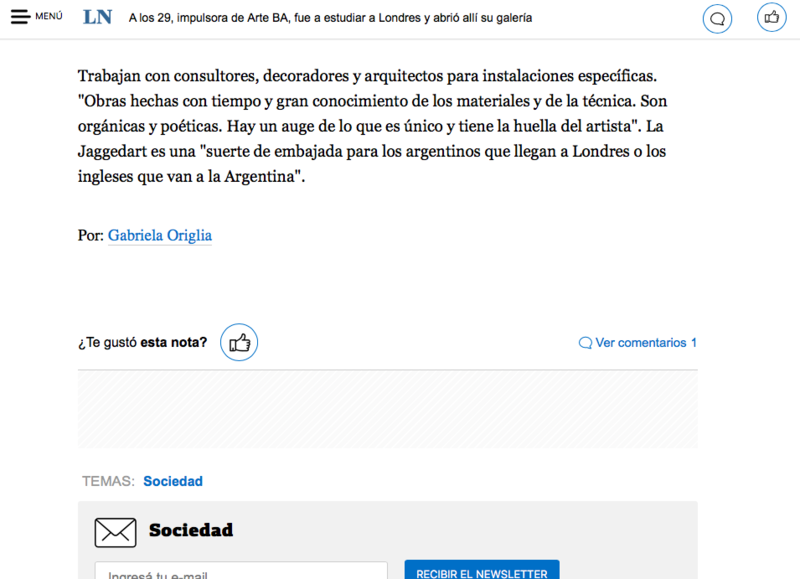 La Jaggedart es una "suerte de embajada para los argentinos que llegan a Londres o los ingleses que van a la Argentina". After 24 years in London, Andrea Harari is defined as a "bridge, a link" between Argentine and English art. She understands that the city she adopted in 1995 was "continentalised" - although she admits the enormous expectation and uncertainty that Brexit opens up - and that facilitates exchanges. "Culture is a great way to unite, educate, entertain and inspire the public, the next generations, and create job and investment opportunities." Since 2001 she owns jaggedart, an art gallery in Marylenbone with her business partner Janeen Haythornthwaite; They met at Christie's, where Harari had arrived from Buenos Aires to study for a few months. She was 29 years old and did not intend to stay. She had studied Literature at the University of Buenos Aires and was one of the promoters of Arte BA. "I always wanted to study and spend time abroad and I thought that if I did not do it at that time it would not happen any longer," she says, "I wanted to live in London, to be in the museums and galleries." Fate modified her plans and offered her a job in Cork Street, which in those years was, "the street of the galleries". At that time "almost nobody knew anything about Argentina, except for Maradona and the Falklands, nor London valued internationalism as much, everything was very English". 1991 marked her career because she started with ARTE BA -the idea was to gather many galleries under one roof- as a link between the Recoleta Cultural Centre (mobilised by collector Jacobo Fiterman), the Undersecretary of Culture of CABA and an advertising agency who would work on the project. Harari was 24 years old and had organised several shows such as Folon & Glaser and Basaldúa; that of Guillermo Roux in the Alvear Palace Hotel and in the Museum of Decorative Art with Laura Haber. In less than three months the first edition of the Buenos Aires art fair was born. She admits that they did not have the vision that Arte BA would become what it is today; she even remembers a meeting in which many gallerists were quite reluctant, "but there was a spirit of collaboration and desire". As usual, reality exceeded expectations and the fair achieved international significance. ARTE BA Foundation was "small as a family, but with a huge engine, with Fiterman in the lead, it grew to become a unique platform for art in South America." She has an initiative in the pipeline; thinking about returning to ARTE BA but with English collectors "to show them my country and the art there". In 2010 she was invited to collaborate with "Pinta London", an idea promoted by Diego Costa Peuser, Alejandro Zaia and Mauro Herlitzka. "Then Latin American art was not well known here, some galleries showed some artists, but they were few." "Pinta" became the place and time for Latin American art in London; It was done in June to coincide with the meeting of the Latin American Art Committee at the Tate Gallery. The fair was a "great precursor and promoter" for latin American art for a segment of experts and many English and European institutions bought for their collections. The last edition was made in 2014. "The demand for art is huge, international, with tastes so varied and different that there is room for everyone, there is a respect and seriousness in how things are done, words have weight and if someone says something, it is fulfilled", she reviews and mentions an anecdote shortly after arriving: "In my first job I told my boss that a client wanted to pay with a check, if he could accept it." He looked at me as if I came from Mars. " She emphasises that the advantage of Argentines is that they are "resourceful", that is, they see opportunities and think outside the box. "We know how to work with few resources and we have a flexibility and spontaneity that helps, but being professional, complying with things, programming with time, that is fundamental". In her gallery they have a very defined aesthetics and programming; they began with works on paper cut from books, maps, grasses, textiles, very textured and three-dimensional. "The public at that time was not very used to buying that kind of work, now the aesthetic has changed, we have clients that look for what we show and important collectors that are looking for new artists". They work with consultants, decorators and architects for specific installations. "Works made with time and great knowledge of materials and technique, they are organic and poetic, there is a boom of what is unique and has the mark of the artist". jaggedart is a "kind of embassy for Argentines who come to London or the English who go to Argentina."